Gestern nacht hatte ichendlich mal zeit, weitere neue Materialien auszuprobieren. 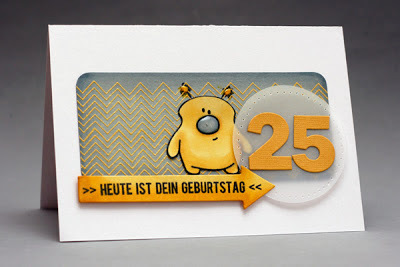 Das ist ein Textstempel aus der Stempelküche, den ich extrem schön finde! 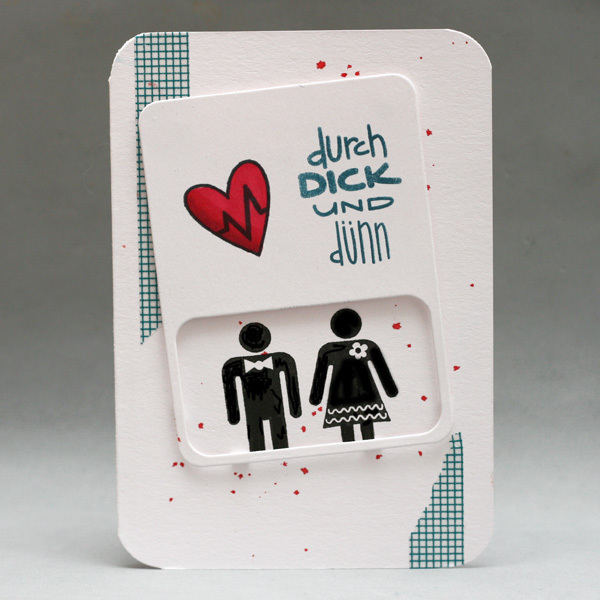 Eine alte Bekannte heiratet bald kirchlich und bat mich, einmal für moderne, nicht zu klassische Einladungskarten mit zu überlegen. Vorgaben waren: Petrol und gerne etwas mit "Fenster". Dies war mein Entwurf, der ihr leider nicht so gut gefiel wie erhofft. Ich mag sie trotzdem ganz gern. 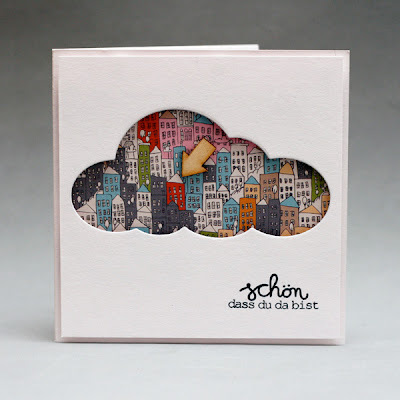 What a fabulous assortment of cards...love the city scape design! 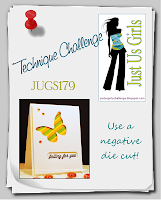 Way to use negative dies on ALL of this cards -- FABULOUS!! Oh yeah - Thanks for joining in with JUGS! Witzig, die Pfeil-Karte gefällt Dir nicht so gut und ich finde sie bombastisch. Hast Du eine Stanze für die Kreise? Das würde mich schwerstens interessieren. Your cards are DARLING! ALL OF THEM! I love your clean, simple designs! Thanks for joining us for Crazy 4 Challenges! what fabulous cards, Christine! love each one! thanks for joining us for the fun at The Pink Elephant...you rocked the colors! i think all four of your cards are amazing!!!! 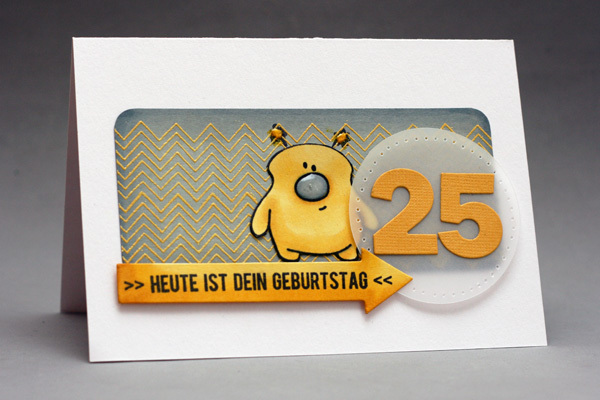 the mustard yellow birthday card is awesome!!!!!! the circular arrows are fabulous!! the cloud cut out is OUT OF THIS WORLD. i am in LOVE with it!! it's my new favorite card!! i just want to look at it all day!! awesome!! The first one is my fave too but all of them are magnificent such beautiful work your designs,layouts and attention to detail are flawless and I love that you always mange to inject a little humour into your cards. Fabulous cards! Thanks so much for playing along with us at The Pink Elephant! Congratulations, Christine! Your card that you entered into our 'Anything Goes' challenge won our Facebook Favorite this week. Please see this post for more details and be sure to grab your winner badge! Your cards are beautiful and creative. Thank you for participating in the ABC Challenges Anything Goes Challenge this week! I always look forward to seeing what you make Christine. Your cards are always unusual and very creative. Brilliant!! With my other hat on Thank you for playing along with the ATS&M challenge. I am the beginner in scrapbooking and have to say I absolutely love your cards!Cheers! Gorgeous designs! Love the city in the cloud! You made really lovely card, as my favourite is the city in the cloud. Hi from Slovenia.